A mass of dragonflies dancing among swirls of colour. 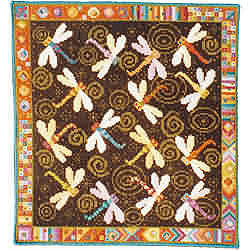 Beads are used to add another dimension to the dragonfly wings. The kit uses Anchor tapestry wool on 10hpi canvas and measures 16" x 17" (40 x 42.5cm) suitable for a pillow or cushion.